First of all, congratulations to the companies listed in the report. Although many of the names and management teams have changed over the last 10 years, GXS (GEIS), Inovis (Harbinger), and Sterling Commerce (now div of AT&T), still lead the way. Ten years ago, complete B2B outsourcing was just catching on. Back in 1999, it was still about in-house software and a dedicated staff to run it. Apparently, GXS saw the light, and positioned itself properly, eclipsing Sterling Commerce from the leader position of the industry. I wonder what the industry pioneers, Sterling Williams and Sam Wiley, think of their baby losing her leadership role in the hands of AT&T. I bet those two BonVivants have their minds elsewhere. I've seen Sam's name in the Wall Street Journal a couple of times. Once the CA (Computer Associates) board paid him off not to unseat them, and another had to do with his novel approach to hiding his millions in the Isle of Man. But that is another topic for another time. What is more interesting here is that a handful of contenders have entered the leadership circle to give the big three some real competition. A couple of German firms making their way into the North American market. 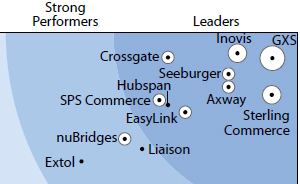 SPS Commerce who did a good job of redefining itself early on to earn its spot in the leadership circle. I'm personal familiar with all of the companies listed as they have been doing business for a while in this space. But who the heck is Liaison? Do they have any customers in North America? Now I think Ken Vollmer did a nice job with his 50 point inspection of the industry. In my 14 years of industry experience, I have done business with almost everyone on this chart. And even the ones that I have not done business with directly, I had contact with their customers. My finding have been slightly different from Ken's. There might be different players to highlight and some more insightful findings of some of the ones listed above. 1. The most important aspect is reliability of the network, not just redundancy of servers but accountability of the transactions. Yes, some transactions find a black hole in these electronic networks and hopefully it's not your invoice. 2. The second most important issue is service and support. If you can't get a transaction to go through at 5 pm on Friday, you want a dedicated and properly trained rep who is going to take your call and fix the problem before leaving for the weekend. 3. The cost. Not just the price that you are going to let these contenders compete and bloody themselves over, but the total cost to you and your supply chain. As one example, you might find that a smaller player like Extol, might have a unique business focus that makes their offering the most efficient. All of these providers are qualified to compete for your business. Take your time, because once you decide on a supply chain information partner, it is REALLY PAINFUL, to make a switch to another provider. That is based on my personal experiences no matter what your new provider may tell you. As an industry professional and now blogger, if I may offer further assistance, shoot me a note. I got an iPhone and I am usually quick to respond. Rob, thanks for the sharing this article, very timely as there has been significant increase in EDI / B2B interest this year and as you put it “The cost. Not just the price” has been top of mind. To expand on your comment about this and value of unique business focus. We have seen customer’s increasingly appreciating understanding of their business challenges and goals they are focused on, this is where service flexibility, ability to deliver unique solutions and top of all, offer expert advice to customers on industry’s best practices for delivering on their objectives wins business. Rob, you share an interesting perspective regarding the recent Forrester Wave report. The report highlights the increasing demand for multiple areas of integration - EDI / B2B / EAI / BPM / MFT– and so I thought it would be helpful to remind your readers, though we consider B2B services to be an important part of our overall integration offering, Sterling Commerce is also recognized by the analyst community as a leader in B2B gateway software, managed file transfer (MFT), and integration as a service. Our breadth of value to our customers also extends to supply chain applications, represented by our leadership or visionary position in analyst reports on order management hubs and transportation and warehouse management systems. No other provider in this report can claim this level of industry leadership. Rob, to help you and your readers answer the question "who the heck is Liaison?"... We're one of the few remaining 'pure play' SOA integration networks and as a result can provide unique perspective, as a practitioner, of best practices and strategic consulting in the area of B2B/EDI integration. We deliver enterprise B2B & A2A project outsourcing, MDM & business process management consulting, integration and data management services... and yes, we have many US customers. I would welcome the opportunity to talk further to you or your readers.